The wait for No. 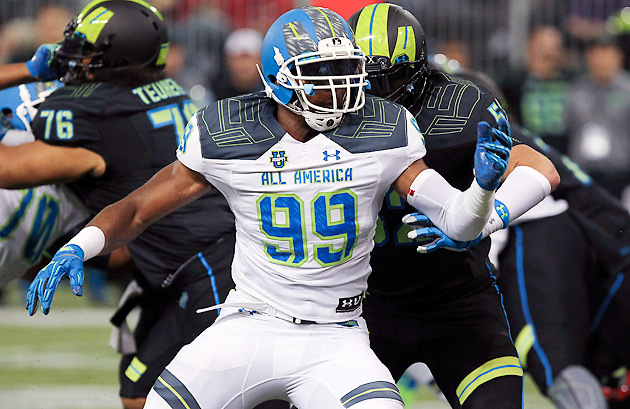 1: Where will 2015's top-rated recruit Byron Cowart land? Byron Cowart boasts an exceptional combination of size, speed and power, so naturally everyone's eager for him to pick his school on National Signing Day. Who will it be: Florida or Auburn? Byron Cowart carries around a Chucky doll, recently deleted his Twitter account and, come Wednesday, will finally announce where he has decided to bring his rare combination of size and speed. The No. 1 prospect in the class of 2015, according to Rivals.com, has the ability to transform an entire recruiting class. It’s easy to see why. There aren’t many people who weigh 250 pounds, can run a 4.6 40-yard dash and hit as hard as Cowart. All eyes are on the defensive end out of Armwood (Fla.) High as recruiting nuts look for clues to figure out where he is headed. Signing Day 2015 roundtable: Which programs will land touted prospects? But first, back to that Chucky doll. Why does Cowart carry it around? Chucky was clearly an inspiration. In Under Armour practices Cowart seemed possessed, raising his game to match the superior level of competition. If he is willing to make that type of commitment in college, the sky is the limit for the 6-foot-4 edge rusher. Smith coached defensive backs for Cowart’s Team Highlight in the All-America showcase, and his Rockets defeated Armwood 24-10 in the Florida Class 6A state championship on Dec. 13. Cowart may have been playing angry over having lost that title game, or maybe he just wanted to prove himself against the best players in the country. But he made the most of the chance to play one more time. Cowart earned MVP honors after recording four tackles and a sack. He also had a fumble recovery for a touchdown taken away after an official review. Cowart explained the week of the Under Armour game that he borrowed the idea to carry around the famous horror movie doll from former Florida defensive linemen Dominique Easley and Dante Fowler Jr. Easley carried the doll everywhere, and Fowler followed suit after Easley went down with a season-ending knee injury in September 2013. So, if Cowart is already imitating Florida traditions, does that mean he is destined to pick the Gators? Florida has been in on Cowart from the get-go, and Armwood coach Sean Callahan’s son Kirk (who played under his father at Armwood) is on the Gators’ staff as the defensive backs coach. There’s a good chance Cowart stays in state, but it’s more complicated than that. Auburn, the other primary finalist for his services, hired former Florida coach Will Muschamp to be its defensive coordinator in December. Don’t be surprised if that plays a role in Cowart’s final decision. And then there’s the matter of Florida State. Cowart canceled his visit with the Seminoles last week and told ESPN.com his decision was “down to Auburn and Florida.” But that didn’t stop the Seminoles from making one more push. Florida State hired Brad Lawing as its defensive ends coach on Jan. 22. Naturally, Lawing’s previous gig was at Florida, where he was heavily involved in Cowart’s recruitment. Common sense says Florida State is out of the running, but this is college football recruiting, where common sense is a fallacy and everyone is trying to read between the lines of 140-character tweets sent out by moody high schoolers. There’s nothing dull about National Signing Day, especially with a player as coveted as Cowart at stake. The wait for his decision is almost over. With or without Chucky, he’ll be free to terrorize college backfields soon enough.